Peter Tabichi is the Global Teacher Prize winner of 2019. 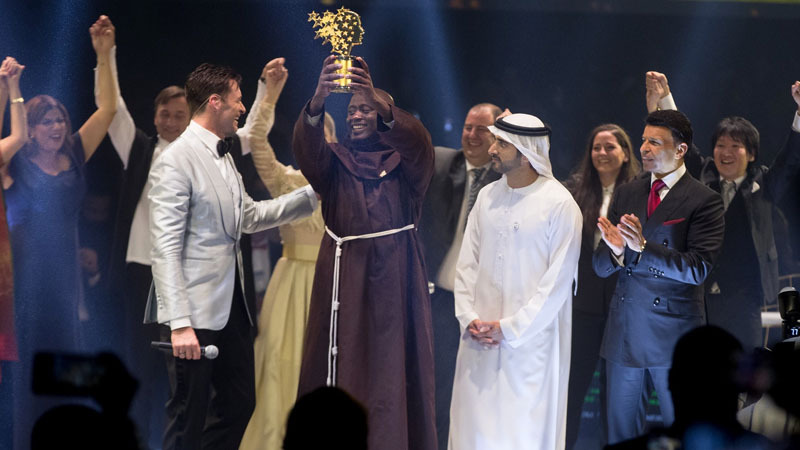 DUBAI – A Math and Physics teacher from Kenya was named the world’s best teacher on Sunday (March 24), winning the $1 million Global Teacher Prize. Peter Tabichi bested 9 other finalists, including former Miss India Swaroop Sampat, who were shortlisted from 10,000 nominees from 179 countries for the Global Teacher Prize. “Every day in Africa we turn a new page and a new chapter. Today is another day. This prize does not recognise me but recognises this great continent’s young people,” Tabichi said in his acceptance speech. It was his first time to travel on a plane to attend the awarding ceremony in Dubai, said actor Hugh Jackman who performed ahead of the ceremony. Tabichi received the award on stage with Jackman and Sheikh Hamdan Bin Mohammed, Crown Prince of Dubai. The Kenyan also received praise from His Highness Sheikh Mohammed Bin Rashid Al Maktoum, Vice President and Prime Minister of the UAE and Ruler of Dubai.